The power of nuclear magnetic resonance, NMR, for characterizing molecules dissolved in solution is widely acknowledged and NMR forms an essential component of undergraduate chemistry degrees. However, the application of NMR to the solid state is much less well appreciated. This text sets out the fundamental principles of solid-state NMR, explaining how NMR in solids differs from that in solution, showing how the various interactions of NMR can be manipulated to yield high-resolution spectra and to give information on local structure and dynamics in solids. 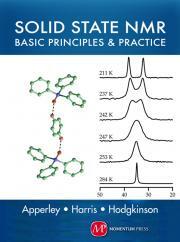 This book aims to take some of the mystique out of solid-state NMR by providing a comprehensible discussion of the methodology, including the basic concepts and a practical guide to implementation of the experiments. A basic knowledge of solution-state NMR is assumed and is only briefly covered. The text is intended for those in academia and industry expecting to use solid-state NMR in their research and looking for an accessible introduction to the field. It will also be valuable for non-experts interested in learning how NMR can be usefully applied to solid systems. Detailed mathematical treatments are delayed to a chapter at the mid-point of the text and can be skipped. Introductions to experiments and numerical simulations are provided to help link NMR results to experimental practice. The different aspects of solid-state NMR, from basic pulse-and-acquire experiments to sophisticated techniques for the measurement of anisotropy information are presented. Examples illustrate the wide variety of applications of the technique and its complementarity to other solid-state characterization techniques such as X-ray diffraction. Various aspects of NMR crystallography are covered as are topics of motion in solids. David Apperley studied chemistry at the University of East Anglia, Norwich and gained a PhD for studies of dipolar coupling in solids from the Open University, Milton Keynes in 1986. He further developed his interest in solid-state NMR while working as a Senior Experimental Officer in the Durham Solid-state NMR Research Service, at first in the Industrial Research Laboratories, and now in the Department of Chemistry, Durham University. Robin K. Harris is an Emeritus Professor at the University of Durham, U.K., where he previously served as Professor of Chemistry, head of the Physical and Theoretical Chemistry section, and Chairman of the Chemistry Department. He obtained his first degree from Cambridge University and undertook research in NMR there, supervised by Norman Sheppard, for his Ph.D.
Dr. Paul Hodgkinson studied chemistry at Queen’s College, Oxford, completing his PhD in 1995 on the sampling of NMR data. His interests in solid-state NMR developed during postdoctoral research at UC Berkeley (Royal Society / NATO fellowship with Prof. Alex Pines) and at the Ecole Normale Supérieure de Lyon (Marie-Curie fellowship with Prof. Lyndon Emsley).